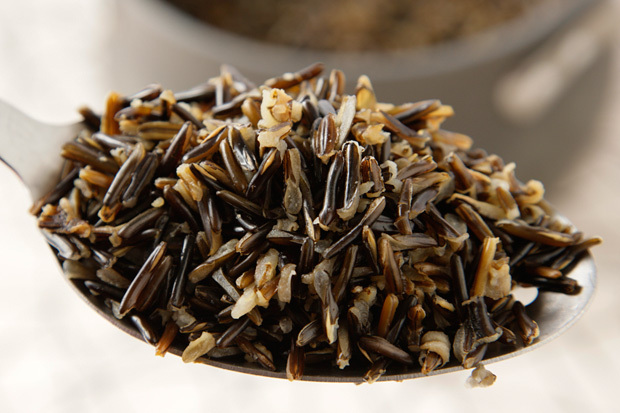 This is a delicious dressing recipe that is an excellent gluten-free alternative to traditional stuffing or dressing recipes utilizing wild rice, which is rich in fiber and healthy nutrients. Walnuts are a great source of omega-3 fatty acids, cranberries are rich in antioxidants and fennel is an excellent source of vitamin C. This recipe yields 6 servings and makes enough to stuff a 12 pound turkey. Combine rice, water, broth and fennel seeds in a large, heavy saucepan over medium-high heat. Bring to boil, reduce heat to medium, cover and simmer until rice is tender, stirring occasionally for about 1 hour. Drain. Cook sausage in heavy skillet over medium-high heat until cooked through. Drain the fat from the sausage by removing from the skillet with a slated spoon and setting on a paper towel. Sauté onion and fennel in the left over fat from the sausage until they are translucent, about 10 minutes. Add rice and sausage back to the skillet to combine with onion and fennel and cook through, about 3 minutes. Stir in walnuts and cranberries. Season with salt and pepper to taste. If served as a side dish, can be prepared ahead and saved covered in the refrigerator for 1 day. Reheat at 350 degrees F for 20 minutes. If served as a stuffing, cool completely and then fill bird and cook as desired. Mallory Aye is a student in the naturopathic medicine program NUNM. She has worked for the Food as Medicine Institute for the past four years and loves working with the community, teaching people the value and importance of cooking with whole foods. Her food philosophy is that there is no one size fits all diet, but that everyone can benefit from adding more whole foods into their diet. She loves empowering people by helping them realize how they can improve their health through the food they eat.